SEO is the process of ensuring a website appears high on the list of results when a relevant keyword or term is searched by a customer or user. Organic listings appear on the left side of a SERP (Search Engine Results Page) beneath relevant news stories and some paid ads and are entirely free. The number of organic listings that appear range from anywhere between three to seven and are often dependent on previous online behavior from the customer. The listings and their rank and visibility on a SERP are the result of SEO utilizing a clear and focused content strategy based on keyword research and competitive analysis of other businesses within the target market. KMB Local Marketing works with you to ensure the content of your website is optimized with the keywords and terms customers are using to search for the types of products and services your business offers. This includes all copy and imagery on the pages of your website as well as meta descriptions and appropriate HTML coding when possible. Technical audits will ensure that the proper schema markup, 301 redirects and canonical URLs are in place and will measure site speed. KMB Local Marketing then refreshes that content and updates it periodically in order to keep your website relevant and noticeable to search engine crawls and indexing. Why is SEO for Small Businesses Important? For more information on our local SEO service or pricing plans, call (262) 853-5325 or email info@kmblocal.com. For local searches, Google Maps and Google My Business results will appear in the middle of the SERP, between the paid ads at the top and the organic listings below. Google Maps current format shows the top three local business related to the customer’s search with an opportunity to view more by clicking into the application. In order to appear in the top three Google Maps listings for a location, a business will need an operating address within the searched location, a strong online presence consisting of a well-maintained, optimized website, customer reviews and other factors for Google to determine the business’ relevancy. Optimized Google Maps listings consist of your business’ name, services, phone number, operating hours, directions, customer reviews and a link to your website. KMB Local Marketing will maintain, update and optimize your Google Maps listing as part of our SEO core package in order that your business ultimately appears within the top three listings on the SERP. Paid search via Google Adwords complements a sound SEO strategy and further enhances a business’ online presence and visibility to its customers. 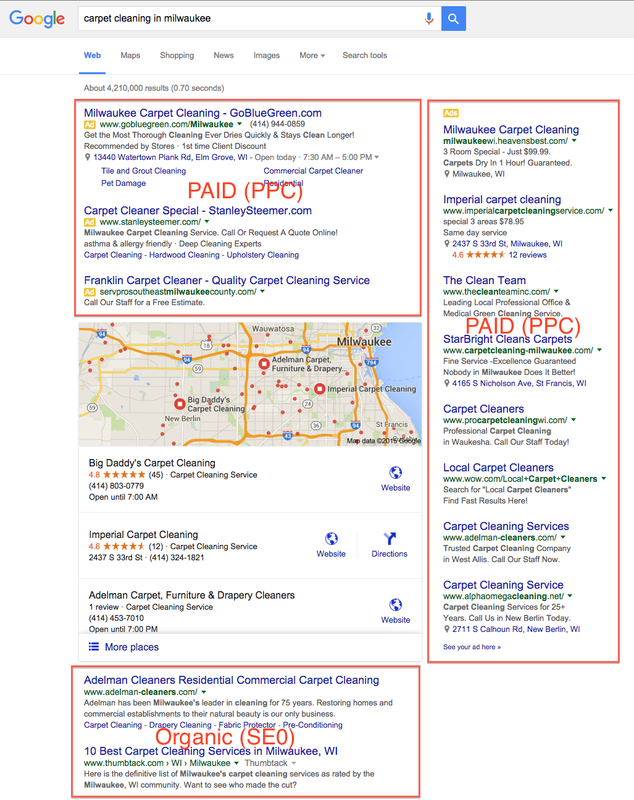 Paid search appears at the top of a SERP or on the right. Each time a customer clicks on a paid ad, the cost of the click is subtracted from the account budget assigned to each day. This is known as “pay-per-click”, or PPC, where the cost of each click varies depending on how competitive the search terms are within your PPC ad campaign. Paid ad campaigns appear at the top of a SERP or along the right side of the page and are monitored daily by KMB Local Marketing with an assigned budget for each campaign that can be adjusted immediately based on the clients needs or request. Similar to SEO, paid ad campaigns are based on keyword research and relevant search terms to the services your business provides and the local market your looking to increase online visibility within. What services are right for your business? Call (262) 853-5325 or email info@kmblocal.com for detailed information and pricing plans. Social media is the new word of mouth with millions of customers logging into their Facebook, Twitter, Google+ and Pinterest accounts (among others) to discuss the products and services they love with their friends, families and co-workers. A strong, consistent social media presence is vital in building and maintaining your online visibility to your customers with an estimated 1 billion people logging onto Facebook each day. KMB Local Marketing will post multiple times each week to various social media outlets on subjects pertaining to your business, including sales and events, customer reviews and relevant national and local online articles as well as more conversational and light-hearted topics suited for your audience. When it comes to SEO, content is king, especially fresh content. There is nothing Google loves more than to see new content consistently added to a website to confirm that that website and business are still relevant to searchers and customers. One of the best strategies to provide fresh content to search engines and customers is by featuring a blog either on your business’ website or by creating a separate blog.com that would discuss topics relevant to your business and link back to your website. KMB Local Marketing writes weekly blog posts containing 500+ words, imagery and video when possible. Each blog post can then be shared throughout all social media channels to increase exposure to the post and your website. Similar to social media, local listings are another digital outlet for customers to connect with each other and recommend and review local businesses, the most popular being Yelp!. Local listing pages provide businesses the opportunity to post their phone number, address, operating hours, website link and a short description of their services along with images and the ability to constructively respond to customer feedback. KMB Local Marketing creates accounts for your business on all relevant local listing websites and then maintains that content, updating information as needed or when requested. The more listings linking to your business’ website the more equity it builds within the search engines indexing. “If your business is not on the internet, then your business will be out of business.” – Bill Gates. Any successful business requires an optimized website online. Your business needs a fully operational website with multiple pages listing its contact information, services, location and other helpful information, including images and videos and a blog when possible, for customers. KMB Local Marketing will create and host an optimized website for your business using the Wordpress.org platform that displays all relevant information to your customers in a professional, well-designed manner. Websites will include Google analytics integration.